The Three of Wands. Virtue. Spring. Blossoming. Conception. Foresight. Leadership. Setting an example. The Three of Wands – or Virtue – corresponds to the Sefirot Binah, which represents duality, passivity, and the feminine. As such, the Three of Wands meets a form of contradiction here; it is the water of fire. It is where the active energy of the Wands meets the passive energy of Binah. As such, the themes of the suit of wands are expressed in more concrete terms here; Chokmah is the energy and force of the duality of Sefirot two and three, and Binah is the interpretation and receiver of that energy, and reflects it back as something new. As the head of the Pillar of Severity, Binah also serves the role of restricting, for the first time, the energy of fire. As such, while the Two of Wands describes active characteristics in a person, situation, or object, the Three of Wands describes more passive characteristics, yet still reflections of the energetic suit of Wands. Creativity is represented by the “gentler” force of conception and brainstorming, the forces of Will and Drive are represented by replaced by the more passive quality of Foresight, and at the crux of the card as seen in its name, Power and Control are replaced by the idea of leadership, particularly by virtuous example. It takes a man or woman of passion to lead, and so the energy of Wands is expressed most through this aspect of the card. The Rider-Waite art shows a man standing above a cliff-edge, somehow placed above the world but also looking down on it; he can see into the distance (foresight) better than most can, and at the same time exudes the gentle air of a thinker; he embodies, as the receiver and interpreter of the energy of Wands, how the best of the Suit of Wands and Fire can be seen in the world. The Thoth illustration shows three crossed wands, and while behind them one can still see emanations of power, they are much more subdued than those of the Ace and of Dominion. 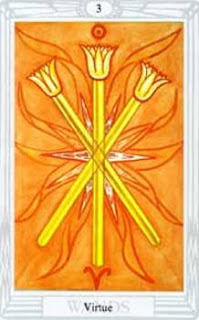 The Three of Wands, then, represents the “soft” side of the Suit of Wands, while the Two is the “Hard” side – both cards represent one half of the duality of the characteristics of Wands, and one who can harness the power of both will certainly be strong. In a reading, this card emphasizes the importance of foresight, and can also indicate renewal and blossoming; in this way, one can draw parallels to the Fool and in some respects to the Sun, with their ideas of rebirth and leading out of the darkness. The Three of Wands, also with reference to the feminine Sefirot Binah, also can represent spring and caring to some extent. The card of Virtue additionally tells us about the inherent nature of something about the situation; to look for how it – or perhaps ourselves – can lead by example, or just take on the role of leadership in general. It advises us to look at how the qualities of leadership play roles on our lives. In reverse, this energy is blocked somehow; look at how you are not using foresight, how perhaps others being leaders are overshadowing you (or if this works for you, how this is benefiting you), or perhaps how conceptual and brainstorming energies are being blocked or inhibited.